Travel allows experiencing alternate lives, even if for a short time. I was recently in Spain for a 10-day vacation. Much to write from this trip, but I will begin with some musings about the meal schedule in the country. There are five main meals in Spain. The day starts with desayuno (breakfast). It is a light meal, most often skipped, which may include a coffee and a toast upon waking up. The almuerzo takes place around 11am. It is a snack, such as a pincho or bocadillo, to keep you going until the main meal of the day: the comida! The comida is the heaviest meal, eaten between 2-4pm. During this time many restaurants offer the menú del dia – multicourse meals for a good price. It may include an appetizer, the main course and dessert. Some establishments offer a glass of wine or beer, and end with a coffee. The comida may be followed by a snack or merienda, before the cena (dinner). The cena takes place traditionally after 8pm, as late as 10pm. That is, the time when most restaurants are winding down in the US are the peak hours in Spain. This is the time for tapas or raciones (learn more here). I decided to research eating times after making the mistake of eating a fideua for dinner. Fideua from La Tertulia (Barcelona). Photo from Google user, similar to the one we enjoyed. It was delicious, but also quite heavy for 10pm. Even after a 20 minute walk back to the hotel, I could still feel the fideos digesting in my stomach as I tried to sleep. In 1940, General Francisco Franco changed Spain’s time zone, moving the clocks one hour forward in solidarity with Nazi Germany. For Spaniards, who at the time were utterly devastated by the Spanish Civil War, complaining about the change did not even cross their minds. They continued to eat at the same time, but because the clocks had changed, their 1pm lunches became 2pm lunches, and they were suddenly eating their 8pm dinners at 9pm. After World War II ended, the clocks were never changed back. While tourists may enjoy late dinners and sunsets in Spain resulting from this change, there are consequences to perpetually living in the wrong time zone – sleep deprivation and loss of productivity. There are ongoing discussions about changing the timezone. These include debates about the relevance of the siesta today. A 2017 study, cited in the above mentioned article, shows that more than half of those interviewed (57.9%) do not nap. Most of those who do nap reported not being bothered if unable to enjoy their midday sleep. Spain is under pressure to change. Some argue that the siesta prevents earnings from midday commerce, as businesses close between 2-4pm, and the resulting odd restaurant hours may inconvenience tourists. Interestingly, tourism is, in fact, one of the arguments for the elimination of the siesta, but also, for keeping the existing time zone. I will continue to follow the debate over time zones and siestas in Spain. Such discussion provide many lessons learned on how sociocultural traditions survive (or not) amid a globalized and homogenizing world. While it did require some planning (and research) to accommodate to Spain’s schedule, in the end, that is part of the beauty of travel. The eating experience in Spain led me to rethink my current eating patterns, particularly the heaviness of my usual dinners. On a typical weekday in the semester, I start with breakfast upon waking up. A lunch around noon. And dinner at some point between 6-8pm. Sometimes I skip lunch, especially on days when I teach. I try to have light lunches, to avoid the afternoon slump. These lunch habits result in overeating during dinner. Being back in my normal schedule at home, I am still trying to figure out how to accommodate my eating pattern. No success yet. I realize how my eating pattern is not only constrained by work schedules, but also by the need to feel “productive” – a mindset that require rethinking naps not as acts of leisure, but as a quick midday recharge, resulting in more productive afternoons. Convenience is a constant topic of discussion regarding modern eating habits. It is blamed for fast food consumption, and the widening of waistlines worldwide. Food habits have changed. The time spent cooking has decreased, along with the know-how. Yet, we seek to come back to simpler times, seen, for example, in the rise of Slow Food and the rediscovery of cookbooks from a recent past, among other trends. It was a spur of the moment decision. 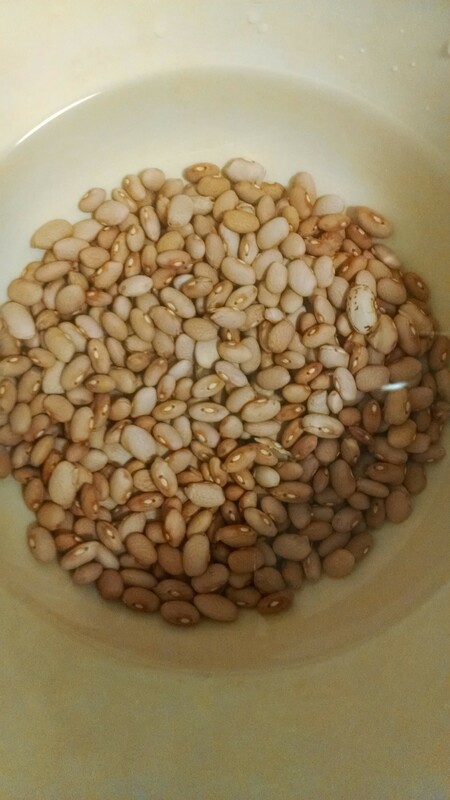 I was not deterred by the need to think ahead, implied by the recipe’s first step: soaking the beans overnight. How to convert “overnight” to hours? No idea. I traded overnight for the 7 hours to be spent at the office that day. But first, how much will I’ll be making? 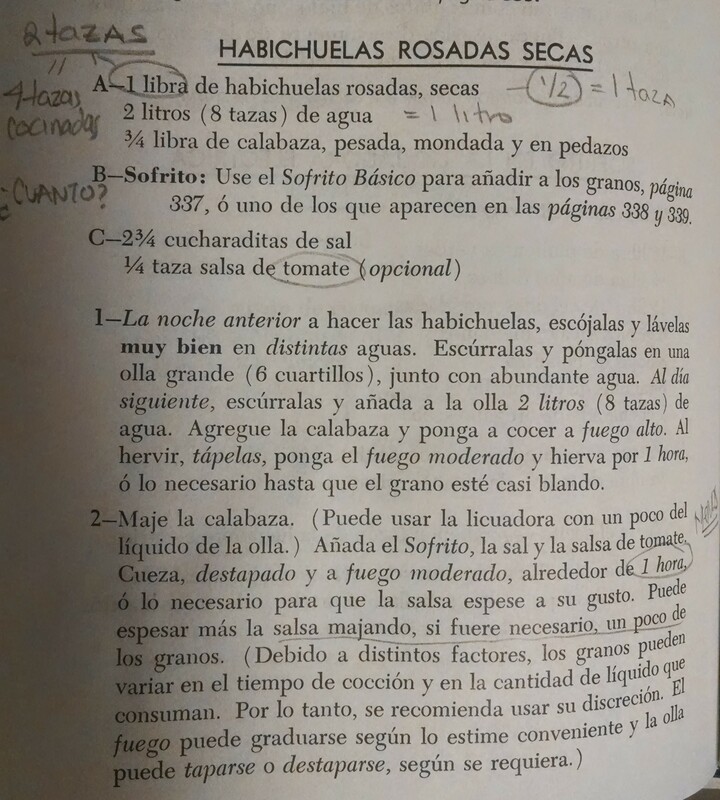 The recipe omits the yield, and I am certain Valldejuli was not cooking for two. 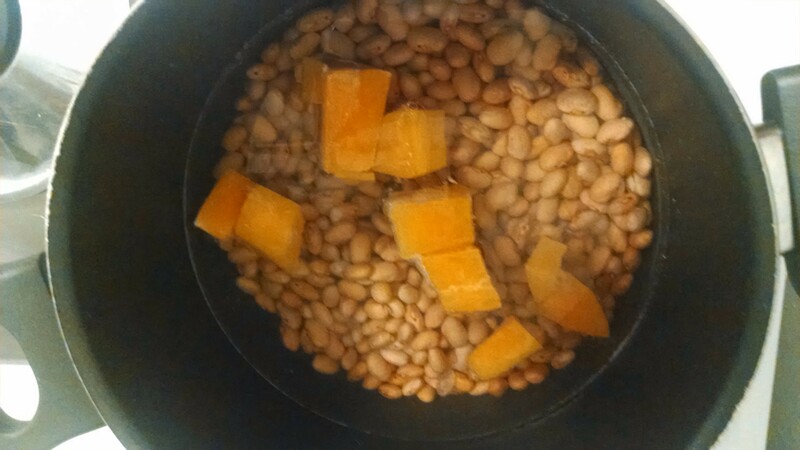 On the safe side and hoping for left-overs, I cut the recipe in two, relying on the internet to convert pounds to cups: 1/2 pound of dried beans=2 cups dried=2 cups (cooked). Next step: the sofrito! Again, no guidance on quantity. I was directed to her recipe which also had no directions on yield. The hope to use the already made sofrito in my kitchen was crushed. I had to make my own, and I improvised using a combination of fresh and frozen ingredients, forgoing the canned tomato sauce for fresh grape tomatoes, and skipping the ham and bacon. 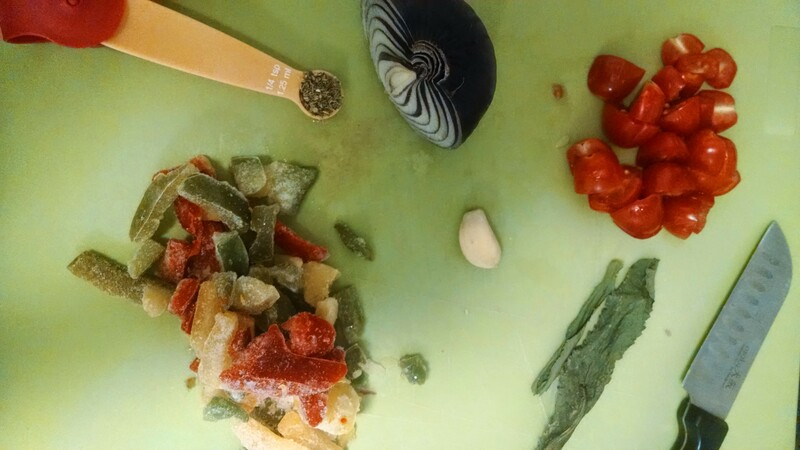 For comfort, I added about a tablespoon of the stored sofrito to the mix. About forty minutes later, we eat! 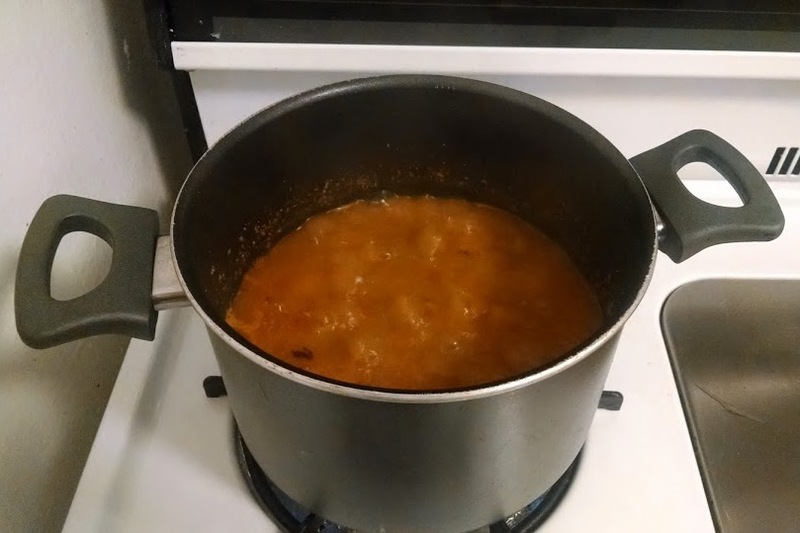 While my improvisation and guess-timates yielded good beans, they were no competition to my husband’s flavoring built and improved through experience, unconstrained by a decades-old recipe. 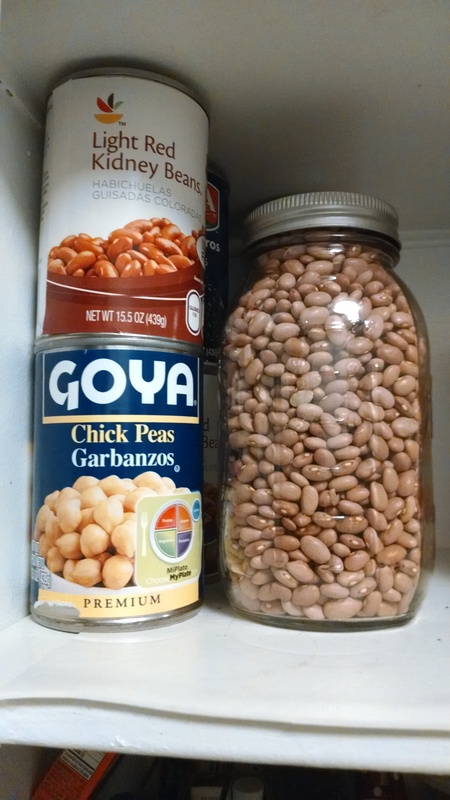 Forgoing the convenience of canned for dried beans had the added value of an improved bite, as well as no sodium, nor preservatives. Yet, the cans sit in my kitchen, conveniently waiting for a last minute decision to quench the craving for home in the plate. As both sit side by side in my kitchen shelf, their coexistence in this space represents a decision between convenience and tradition. Such decision, while in small proportions in my kitchen, represents, in my mind, in a small way, the struggles and complications of the continuing changing food system. We are lured by the convenience of modern foods, as we long for the traditionalism of slow cooking. Will it continue to be a struggle between the quickness of industrial modern foods and the longing for the slow authenticity of the past? Perhaps we will continue to negotiate the coexistence of these foods in our kitchens and plates, ideally in a world of food at “moderate speeds”, as coined by Sidney Mintz*. 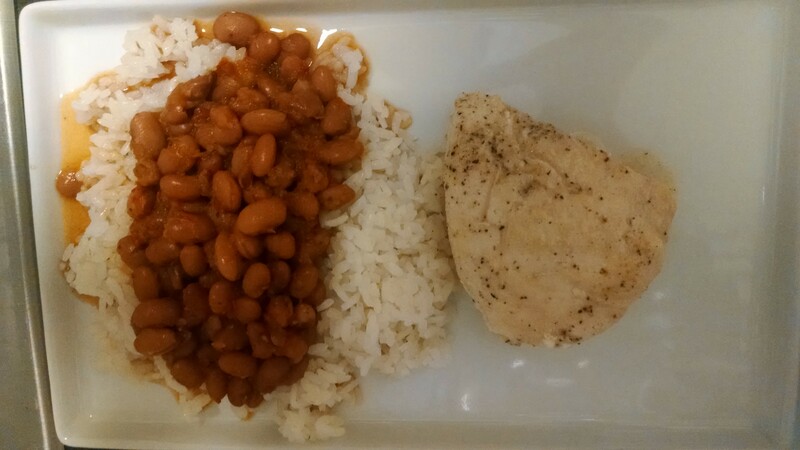 Growing up in Puerto Rico, rice, habichuelas (beans), mofongo, bacalao, bisté were just foods, constant staples in my mom’s kitchen or in family gatherings. There were rare trips to fast foods. Mostly, I remember the trips to Wendy’s at the end of the school semester, when we got our grades. There was the occasional take-out my mom brought home after work. And the ever rarer visits to sit down restaurants, in very special family occasions. I left Puerto Rico in 2001 to finish my undergraduate education in Miami. Back then, I was not familiar with the Puerto Rican community in the area. Luckily, the city’s overwhelming Cuban influence and foods eased my longings for home. But while familiar delicacies such as croquetas and cortaditos somewhat made up for the foods I missed from home, they were not enough. 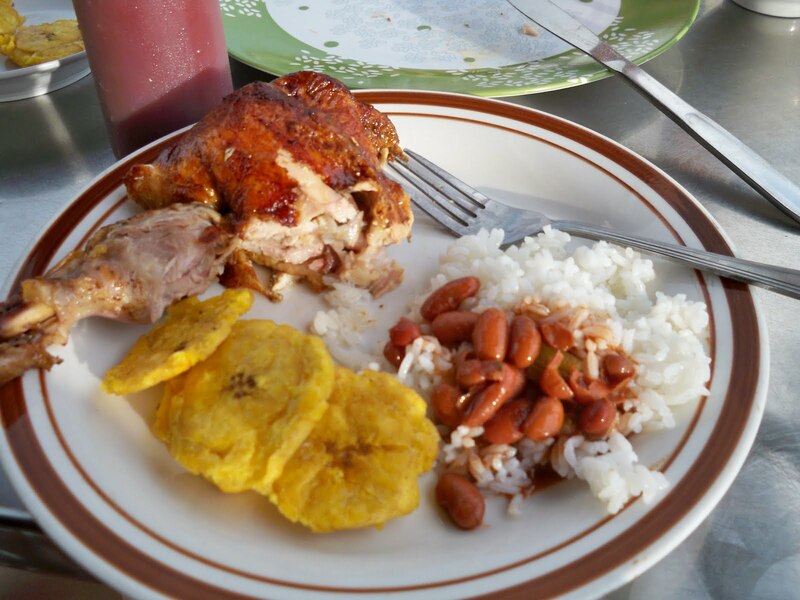 For the first time in life, I consciously sought out my food – Puerto Rican food: a well-made mofongo (not a Cuban interpretation), rice with red beans (not black)… Foods that were so commonplace were no longer just “comida criolla”. They became “Puerto Rican” foods, as cultural affirmations in the midst of the well defined Cuban identity in the city. My move to Miami came with a culinary language adjustment. I learned (most of the times the hard way) about subtle language differences, by the way our cultures named certain foods. It took some time to adjust to the “fact” that orange juice was not called jugo de china, but jugo de naranja, that beans were not habichuelas, they were frijoles, that a chicken thigh and leg was called encuentro, not simply muslo y cadera, and that bizcocho was wrong – the “correct” Spanish translation was “cake”. 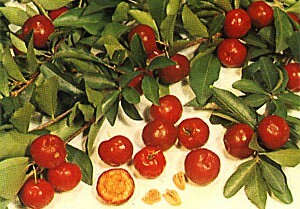 Mental image of “jugo de china” for the non-Puerto Rican. Traditional diets in the Spanish Caribbean have more things in common than differences. Depending on the situation, we might underline these differences, or point the similarities. While Puerto Rico, the Dominican Republic and Cuba share similar colonial pasts, different historical trajectories have resulted in the distinctions in national cuisine. While in Puerto Rico our culinary influences are the usual suspects (Taino, Spanish, African, and more recently, from the United States), Cuba has added influences from China, and the Dominican cuisine has a few Middle Eastern additions. The Spanish Caribbean is an excellent context to understand how notions of national cuisine are constructed and sustained. How are these differences and similarities played out in the Diaspora, in a big international city like New York City? This is the question I am pursuing these days. How do YOU define your national cuisine?